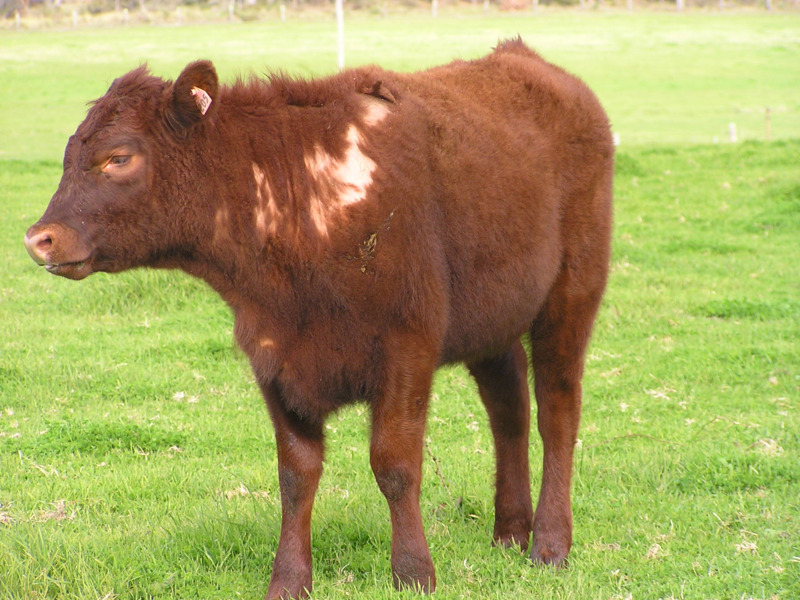 Cattle lice cause irritation and rubbing that results in hair loss and poor coat quality. Cattle won’t always require treatment for a skin problem resulting from a lice infestation. Occasionally a treatment will be required depending on numbers affected in the mob and severity of symptoms. The first step in management of the condition is to rule out other causes of skin disease by confirming the presence of lice through an examination of the animal’s skin. A treatment decision can then be worked through. Lice complete all of their lifecycle on the host with spread from one animal to the next by direct contact. Sucking lice (Linognathus vituli) feed on blood while biting lice (Bovicola bovis) feed on dead skin cells, hair and oil secretions. The adult female louse lays one egg per day, gluing it to a hair shaft close to the skin. Eggs hatch in 1-2 weeks releasing nymphs. Each nymph undergoes three nymphal stages, with each of these taking about 10 days to complete (dependant on variability in surrounding air and skin temperature). The louse lifecycle spans between3-6 weeks. They live about 42 days with the female laying up to 50 eggs in her lifetime. Lice can be suspected when cattle show signs of rubbing. Rubbing causes hair loss which is commonly seen on the neck, shoulders and rump areas and is generally more severe than seasonal shedding of winter coat. Infestations of biting lice are rarely found in WA with the most common infestation being sucking lice. The presence of lice can be confirmed by close examination of the hair and skin of visibly affected animals. Frequently, lice eggs are more readily seen than lice themselves. Eggs are white in colour and are cemented to the shafts of hairs in clumps. Biting cattle lice are highly mobile (as they move when the hair is parted). Sucking lice are grey or blue grey and have a pointed head which tends to remain fixed to the skin. Good lighting and a magnifying glass will also help to see lice. You will see a variety of expression of effect of lice across cattle within a mob. Individuals may show greater irritation and hair loss than others. Cattle in good body condition are generally less affected by lice because adequate dietary energy is available to be channelled to the immune system. Cattle in poorer body condition, receiving maintenance nutrition, will not have the energy reserves to partition to the immune system and consequently lice burdens are able to build up. The most common species of lice on cattle in WA is the sucking louse (Linognathus vituli). The long-nosed sucking louse is most common, with adults about 2.5 millimetres (mm) long. They are widely distributed over the body, with the main infestation sites being the neck, shoulder, back and rump. Solenopotes capillatus (small blue sucking louse): smallest louse (about 1.2-1.8mm), usually found at the head and neck in clusters. Haematopinus eurysternus (short nosed sucking louse): comparatively large (about 3-5mm) and usually found around the horns, eyes and tips of ears. Haematopinus quadripertusus (tail switch louse): found in tropical locations and has also been reported in the Kimberley. Large in size (about 4.5mm) and found in the long hair in the brush of the tail. Haematopinus tuberculatus (buffalo louse): usually confined to cattle of northern Australia and is a large louse (about 5.5mm). Bovicola (Damalinia) bovis (the biting louse): common, small in size (up to 2mm). Infestation occurs mainly on the head, back and shoulders of cattle. Light infestations do not usually detract from growth rates. Treatment of the most notably affected individuals may be all that is required. However, heavy infestations in poorer condition animals can and may warrant treatment of the whole herd. Even with whole herd treatments it is difficult to completely eradicate lice from a herd as treatments rarely kill every last louse. It is possible that a small number of lice remain in tucked away places (for example, inside ears) that may not be exposed to externally applied chemicals or adequate chemical circulating in the blood stream (from pour-on applied chemicals). Nevertheless, chemical treatments generally knock lice populations back to low levels from where an active immune system can then keep them in check. Lice control in cattle should be considered as a separate treatment to worm control because lice and worm treatments are likely to be given at different times of the year. In cases where a herd is severly affected by lice, a treatment may be required for all groups of cattle in the herd. Although ML products will suitably check a lice population, cattle may not need the drench effect on worms. In cases where a drench and a lice treatment are needed, then a dual purpose product should be used. If a 'lice only' treatment is required, then a topical spray-on 'lice only' treatment is recommended. It is recommended that 'lice only' treatments be used against lice infestations and ML based products used when a treatment for both lice and internal parasites is needed. There are various products available within the synthetic pyrethroid and organophosphate chemical groups that specifically treat cattle for lice (see Table 1). It is essential to accurately know the weight of cattle in each treatment group, read the label instructions and observe drench dosage recommendations when treating stock. Export slaughter intervals (ESI) and withhold periods (WHP) must also be observed. Always check label for on-product safety information, contra-indications and ESIs. Note: Mention of trade names does not imply endorsement or preference of any company’s product by the Department of Primary Industries and Regional Development, and any omission of a trade name is unintentional. Recommendations are current at the time of publishing.